Not all blog posts are about pretty pictures. My son said that my trunk looks like a junkyard, and he is right (and I cleaned it up for this picture). 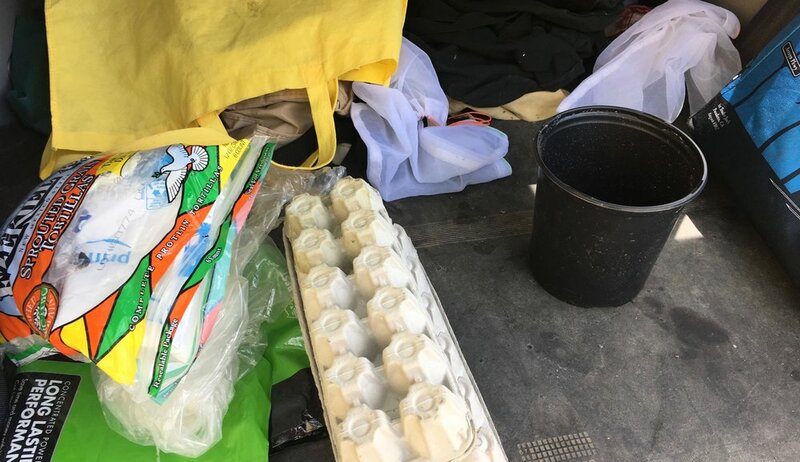 There are the egg cartons to return to the farmer where I buy my eggs. Batteries to return for recycling to Best Buy. Plastic flower pot to return to the nursery where I bought some perennials recently. A whole big pile of reusable cloth bags, a wine carrier, and two cooler bags for my shopping trips. Cardboard boxes and gently used packaging material to be dropped off at my local shipping center. A plastic bag stuffed full with recyclable plastic bags to be dropped off in the supermarket plastic bag recycling bin. Another bag with a few cans and beer bottles to be redeemed at the supermarket bottle center. I am passionate about reducing my pile of true trash, true trash being the residual cast-off items that go to the landfill because they can't be recycled or reused. I can't stand waste. Everything that's put into the garbage increases our overfilled landfills, my personal carbon footprint, and requires more manufacturing - of egg cartons, plastic flower pots, plastic bags, and packaging material. Take a look here at some reflection worthy recycling and trash facts; and here an earlier post on reducing your trash contribution. Please mind your trash.